Go to Decatur Station (E-6). Take east exit for Church Street and west exit for bandstand. Get off at Clairmont Road Exit (91) and go south on Clairmont about 4 1/2 miles until it dead-ends at the Old Courthouse. Turn left onto E. Ponce de Leon Avenue, go one block and turn right onto Church Street. Take Stone Mountain Freeway (US 78) west (Exit 39A). About 1/2 mile after divided highway ends and becomes Scott Boulevard. Bear left onto Church Street. Continue on Church Street about two miles to downtown Decatur. Get off at Covington Highway (US 278) (Exit 43) and turn left. Continue through downtown Avondale Estates (where Covington Highway becomes Main Street) past the Avondale MARTA station. Turn right onto E. Trinity Place. Take Candler Road (Exit 65) north about four miles. After crossing railroad tracks, the road bears to the left and becomes E. Trinity Place. Take Clairmont Road south until it dead-ends at the Old Courthouse. 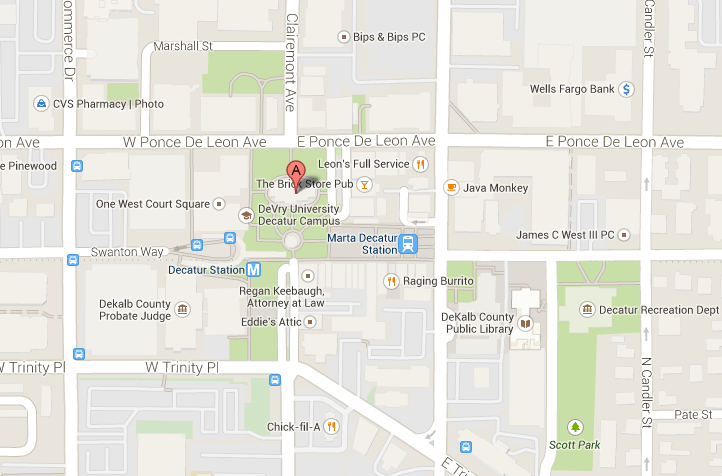 Turn left onto Ponce de Leon Avenue, go one block and turn right onto Church Street. Take East Ponce de Leon Avenue west. Just past Avondale MARTA station, turn left onto Sycamore Street. 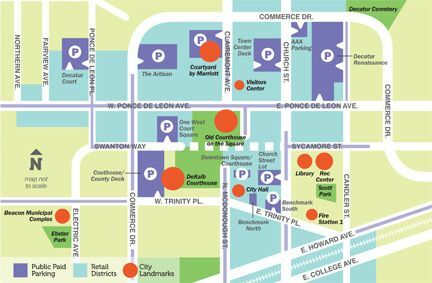 Take Ponce de Leon Avenue east to downtown Decatur. After passing Old Courthouse, turn right on Church Street. Take DeKalb Avenue east to downtown Decatur (DeKalb Avenue becomes Howard in Decatur). Turn left on McDonough Street at Decatur High School.